The global hemostasis diagnostics market is primarily driven by the ever-increasing disease burden of blood clotting disorders. Hemophilia, vitamin k deficiency, and disseminated intravascular coagulation are some of the factors responsible for blood clotting disorders that not only requires relevant treatment, but also timely and affordable diagnosis. As per statistics presented by the World Health Organization, an estimated 400, 000 people worldwide suffer from hemophilia, of which 56% remain undiagnosed. This will stoke growth of the hemostasis diagnostics market. Technological breakthroughs leading to the development of advanced products for hemostasis diagnostics is also stoking growth of this market. This has enabled clinicians to perform varied tasks and bring about efficiency and efficacy in hemostasis diagnostics. A report by Transparency Market Research estimates the global hemostasis diagnostics market to expand at a CAGR of 8.3% between 2017 and 2025 vis-à-vis revenue. At this pace, the market is expected to attract a revenue of US$3,979.5 mn by 2025 from US$1,960.0 mn in 2016. The global hemostasis diagnostics market is assessed on the basis of product type, test type, end-user, and geography in this report. Based on product type, the global hemostasis diagnostics market has been segmented into laboratory systems, consumables, and point-of-care testing systems. Among these, consumables segment accounted for the leading revenue in 2016 and is projected to continue its position by the end of 2025. The end-user segments of the hemostasis diagnostics market include hospital/clinics, independent diagnostic laboratories, home care settings, and others. Hospital/clinics is likely to expand at a significant growth rate over the forecast period of 2017-2022; the segment is anticipated to display increased market share over the period. In terms of geography, the worldwide market for hemostasis diagnostics is divided into five regions: North America, Asia Pacific, Europe, Latin America, and the Middle East and Africa. Of them, North America held the leading market share in 2016. The region, however, is anticipated lose its market share by the end of 2025, expanding at a CAGR of 7.4% for the forecast period. High prevalence of cardiac diseases, well-established healthcare infrastructure, high healthcare expenditure, and high awareness for hemostasis diagnostics are the factors attributed to the growth of the market in North America. Europe follows North America to be the second-leading market for hemostasis diagnostics. High awareness and demand for superior quality diagnostics is one of the key factors driving the hemostasis diagnostics market in the region. However, Asia Pacific is anticipated to surpass all other regions in terms of growth rate from 2017 to 2025. Increasing income levels in the emerging economies of China and India is leading to increased healthcare spending. Moreover, changing lifestyles have led to the proliferation of lifestyle related diseases such as cancer, diabetes, and heart disease. As a result, research initiatives and the corresponding funds in the biopharmaceutical sector have escalated in the region. Further, government initiatives for the improvement of healthcare infrastructure, and increasing shift in base of pharmaceutical companies and clinical research agencies from developed regions to developing regions bodes well for Asia Pacific hemostasis diagnostics market. The business landscape of the global hemostasis diagnostics market is competitive due to the presence of a few established players. At the forefront of this market are Abbott Laboratories, Thermo fisher Scientific Inc., Alere Inc., F. Hoffmann-La Roche Ltd., Nihon Kohden Corporation, Sysmex Corporation, Siemens Healthineers, Instrumentation Laboratory, Danaher Corporation, and Grifols S.A. This report on the global hemostasis diagnostics market analyzes the current and future prospects of the market. The report comprises an elaborate executive summary, including a market snapshot that provides overall information of various segments and sub-segments. The research is a combination of primary and secondary research. Primary research formed the bulk of our research efforts along with information collected from telephonic interviews and interactions via e-mails. Secondary research involved study of company websites, annual reports, press releases, stock analysis presentations, and various international and national databases. The report provides market size in terms of US$ Mn for each segment for the period from 2015 to 2025, considering the macro and micro environmental factors. 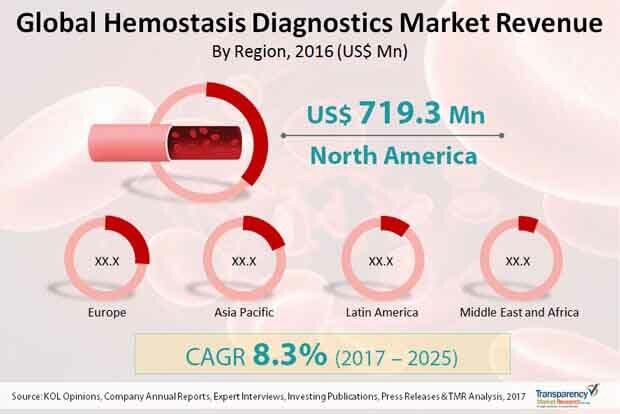 Growth rates for each segment within the global hemostasis diagnostics market have been determined after a thorough analysis of past trends, demographics, future trends, technological developments, and regulatory requirements. A detailed qualitative analysis of factors responsible for driving and restraining market growth and future opportunities has been provided in the market overview section. This section of the report also provide insights into the key trends of the hemostasis diagnostics market such as augmentation in online services, increase in acceptance of disposable products and miniaturization. The key market indicators influencing global hemostasis diagnostics market taken into consideration including cost constraints and regulatory landscape. The report also includes market attractiveness analysis of the major segments that provides a thorough analysis of the overall competitive scenario in the global hemostasis diagnostics market. The report also highlights key events of the global hemostasis diagnostics industry. A porter’s five force analysis highlighting competitive landscape is also included in the report. Market revenue in terms of US$ Mn for the period between 2015 and 2025 along with the compound annual growth rate (CAGR %) from 2017 to 2025 are provided for all the segments, considering 2016 as the base year. The year on year growth of global hemostasis diagnostics market for each segment is also reflected. Additionally, market related factors such as technological advancements, rise in POCT in developed countries, and cost reduction for hospitals and greater affordability for patients in various geographies and historical year-on-year growth have been taken into consideration while estimating the market size. Based on product type, the global hemostasis diagnostics market has been segmented into laboratory systems, consumables, and point-of-care testing systems. On the basis of test type the market has been segmented into prothrombin test time (PT), activated partial thromboplastin time (APTT), fibrinogen degradation products (FDP), activated clotting time, platelet aggregation test, d dimer, and others. Based on end-user, the market has been segmented into hospital/clinics, independent diagnostic laboratories, home care settings, and others. Hospitals segment is expected to remain dominant during the forecast period. Geographically, the global hemostasis diagnostics market has been segmented into five regions: North America, Europe, Asia Pacific, Latin America, and Middle East & Africa. In addition, the regions have been further segmented into major countries from each region. These include the U.S., Canada, the U.K., Germany, France, Italy, Spain, China, Australia, India, Japan, Brazil, and Mexico. The report also profiles major players in the hemostasis diagnostics market based on various attributes such as company overview, financial overview, SWOT analysis, key business strategies, product portfolio, and recent developments. A thorough market share analysis of major companies operating in the hemostasis diagnostics market is provided in the report. Key companies profiled in the report include Abbott Laboratories, Alere, Inc., Thermo Fisher Scientific, Inc., F. Hoffmann-La Roche Ltd., Nihon Kohden Corporation, Sysmex Corporation, Siemens Healthineers, Instrumentation Laboratory, Danaher Corporation (Beckman Coulter), and Grifols, S.A.